 Nicolaus, de Lovanio, ed. Minorica elucidativa. Paris: [André Bocard], for Jean Petit, and Jean Alexandre and Charles de Bougne at Angers, 22 March 1499. Petrus, de Cruce. Preclarissimum opus antiminorica vocatum. Venice: [25 June 1505]. Ludovicus de la Turre. Appologia deffensoria fratum Minorum de Observantia. Antwerp: [H. Eckert van Homberch], [c. 1508?]. Reference: Ellis valuation, fol. 1b, no. 10 (£1 5s.). Cultrificis, Englebertus. Defensorium et declaratio privilegiorum fratrum mendicantium. Delft: Henric Pietersz Lettersnijder, 1508. Reference: Ellis valuation, fol. 35 (10s.). Speed, John. A prospect of the most famous parts of the world. London: printed by John Dawson for George Humble, 1631. References: ESTC (S122258). 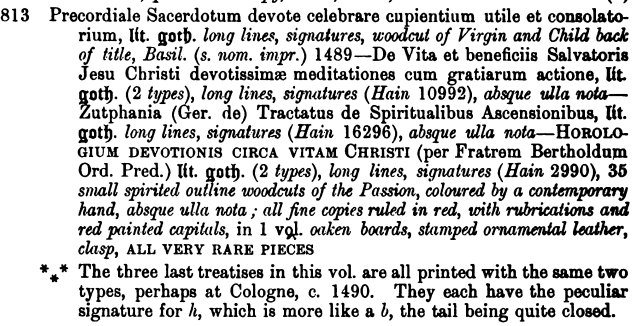 — MS catalogue (1), fol. 14v. — MS catalogue (2), no. 400 (with three X’s next to it). Speed, John. The theatre of the empire of Great Britaine. London: printed by John Dawson for George Humble, 1632 [misdated 1627]. Provenance: Nicolai von Bodeck. — Bodeck sale, Danzig, 5 December 1695. — Morris (purchased for £1 15s.). — Richard Bennett. — Sotheby 1898, lot 1131 (sold to Leighton for £6 10s.). — Emery Walker. — Sotheby (London), 17 November 2015, lot 43 (estimate £70,000–£90,000). — Sotheby (London), 12 July 2016, lot 46 (estimate £60,000–£80,000, not sold). — Offered by David Crouch (dealer) at New York Antiquarian Book Fair, March 2018. — Unlocated. Provenance: Morris. — Richard Bennett. — Sotheby 1898, lot 166 (sold to Chadwick for £1 12s.) — Unlocated.